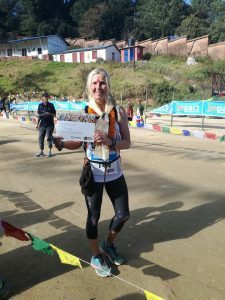 I’m sitting on the airport floor in Kathmandu, its 4am reflecting on the power of running. I want to capture my week in words before the colorful memories are altered by returning to home comforts and normality. So grab a mug of your finest tea and I hope you enjoy. Only a week ago I was asked by Street Child Charity to fill a place as someone dropped out. Although this would be my biggest trip since healing from weils disease, I felt drawn to take the risk. I like the quote, ‘your life expands or shrinks in proportion to your courage’, and aim to live by this. My time with Street Child in Sierra Leone in 2014 just as ebola broke out, was life enhancing and profound. 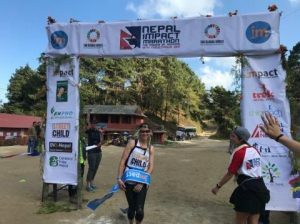 This time in Nepal, Street Child partnered with Impact Marathons, fusing together the powers of charity work, adventure and running. Just what my week would entail I was about to find out. As the plane touched down in the darkness, I felt a flutter of anticipation and fear. Challenges allow us to grow, and without fear, our courage doesn’t grow either. 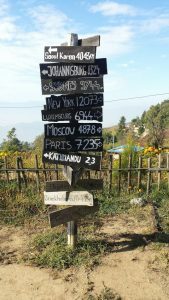 So with a deep breath I stepped into the Nepalese air. And suddenly I couldn’t breathe. No one warns you about the smog which tightens around your throat, stinging your eyes. I had an idyllic picture of many bikes, bright clear skies and smiley faces, these were a plenty. Â Yet even more so was the traffic, from huge trucks to tiny vans, packed tightly with more people than a can of sardines, shrill whistles fill the air managing the traffic. Everyone understands the system, even the goats, yet I have no a clue! Winding our way through the chaos, I arrive at the hotel to meet my roomies for the night and the rest of the Impact Marathon Group, there’s around 30 of us from 19 different countries. I think that is pretty amazing in itself, from Hong Kong to Australia, South Africa to Canada, New Zealand to Columbia, Poland to the UK and pretty much every country in between. After some delicious ‘Dahl bat’ we head for some rest. Dawn breaks around 4.30am, cockerels, dogs and whistles awakening our slumbers. After a quick breakfast, we jump into a van heading for Street Child of Nepal HQ. In the daylight the true chaos and beauty of the city can be seen, combined with the majestic mountain ranges glinting in the clear, crisp air. Nepal brings such diversity it’s hard to do it justice. It’s a young, proud, inspiring country with a big heart, that for sure is evident. 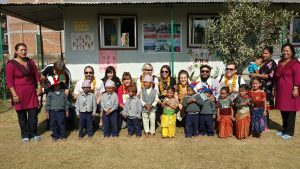 Arriving at the Street Child HQ, we were greeted by a big waggy yellow Labrador, and a Nepalese lesson from Head Office Team! This followed by an outline of two key projects which began after the Earthquake Disaster Relief Work. 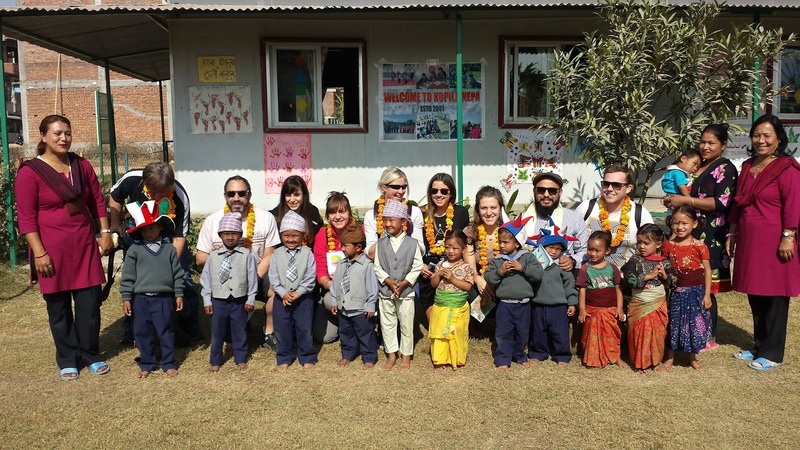 After a yummy lunch with the whole team, we jumped into our van to visit the first project, the Nepalese brick factory school. 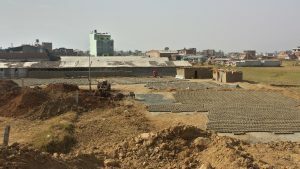 Migrant workers travel miles to work in the brick factories for 6 months of the year, it pays well, but the conditions are tough, with no place to live and long hours, starting around 2am and finishing about 8pm. 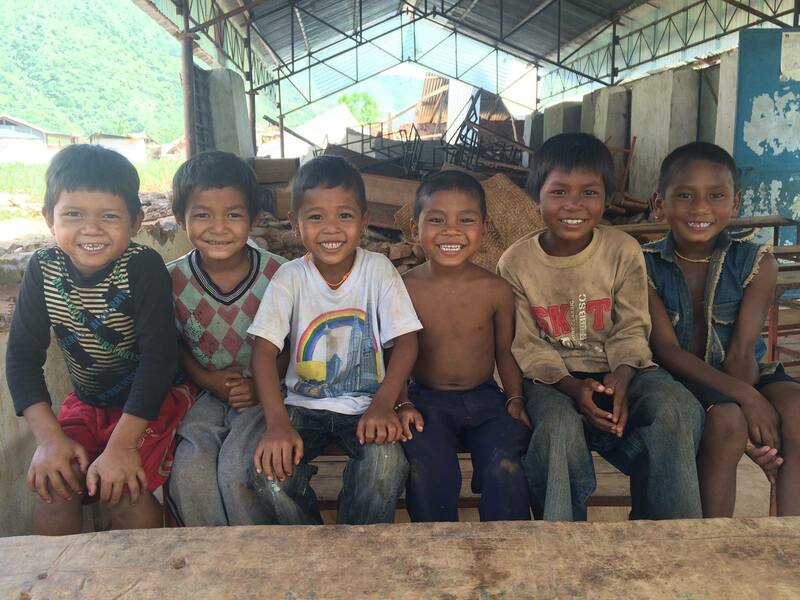 During this time, nearly 60,000 children travel with their parents, and over 60% have never been to school. 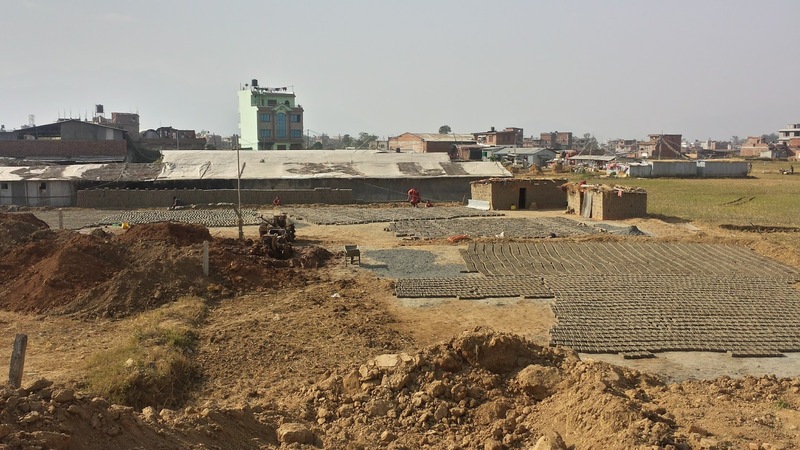 Street Child are starting to build schools to offer basic education, clothing, food and sanitation services during the migrant work period. Seeing this first hand, I can see not only the joy in the children’s faces but the potential of a future for them as they grow up. It truly makes a difference. 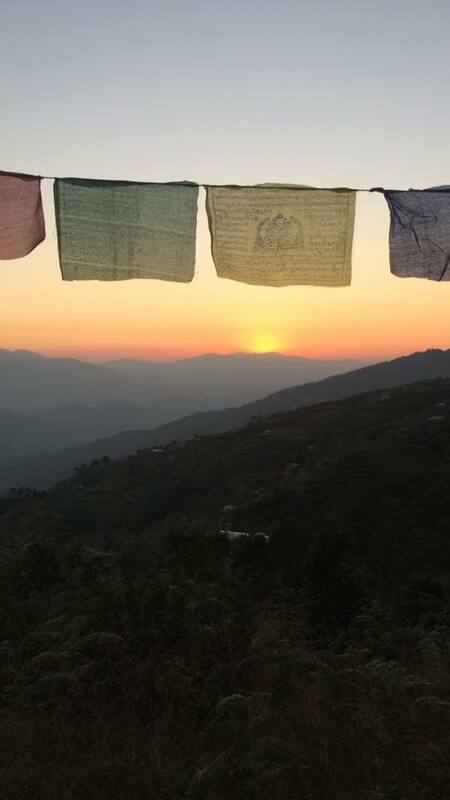 The second project is in the lowlands of Nepal, an area bordering with India and often forgotten in favour of the mountains and hill lands. In here lies members of the Musahahar Communities, considered untouchable, characterized by extreme poverty and bonded slavery. In these communities only 3.8% of the women are literate and the communities often lack any sanitation or running water, the situation is desperate and there is no support for them. Street Child aim to help over 3,000 girls in this community start to have a life and learn. I know there is extreme poverty in so many areas of the World, so who do you help first is a hard question. Yet learning about this project makes me feel lucky to learn, to have levels of respect as a woman and a running tap. From this project, we all bundled into trucks and headed up into the mountains. If you imagine peas in boiling water, it kind of describes the road surface and how we all bumped around in the truck! 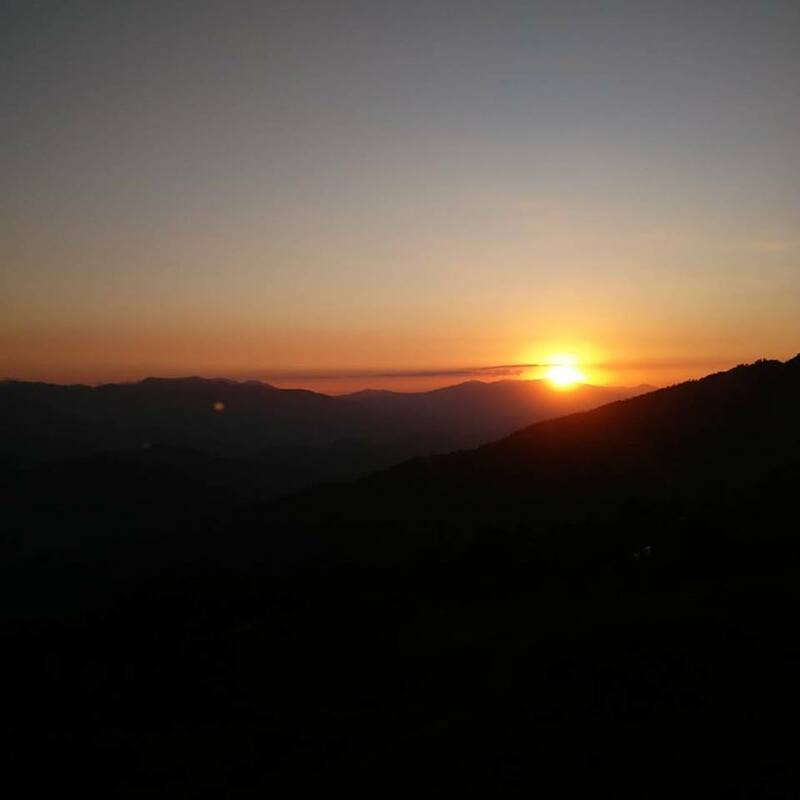 And if you watched Levison Woods Trekking the Himalayas there are moments when you are definitely clinging to the side of the truck, thinking this will be our last moment and then you look up at the view, and think, that’s pretty damn amazing! 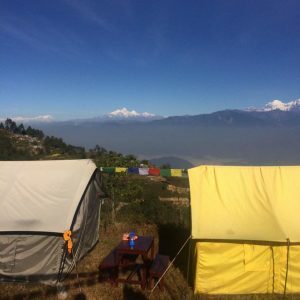 So arriving in the dark at base camp, we clambered into our tents, two down jackets, multiple layers and a wolly hat served about enough to keep me warm! I wondered what the morning would bring and oh wow, just the view took my breathe away and I felt like the luckiest person. 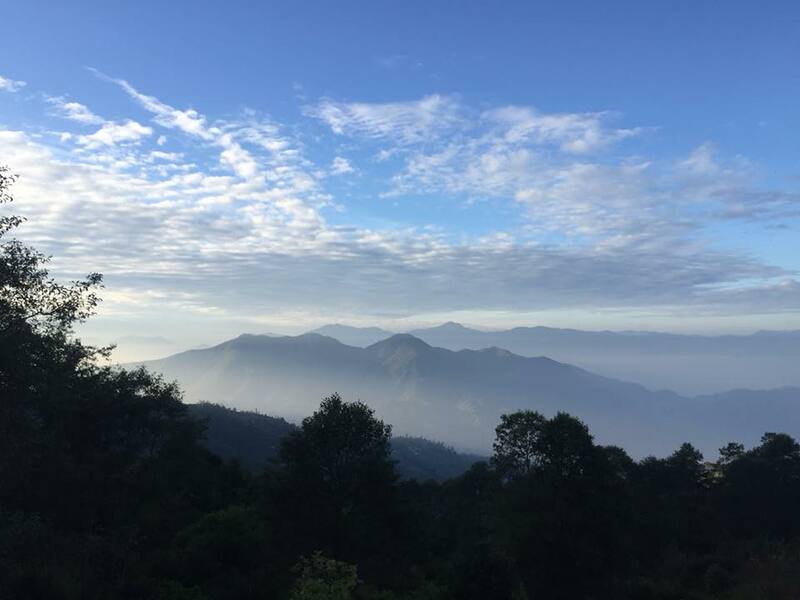 Above the clouds the Himalayan range gradually began to reveal itself. So majestic and powerful, out little camp site seemed tiny, yet bright and colourful with many Tibetan flags blowing in the wind. 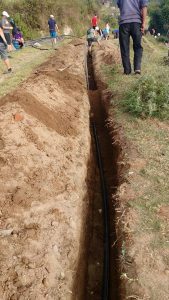 The next two days were filled with hours and hours of digging with pick axes, shovels and spades to lay a water pipeline for another section of the village, picking up where last year’s group finished. The whole community appeared to help, and I can honestly say I loved it. 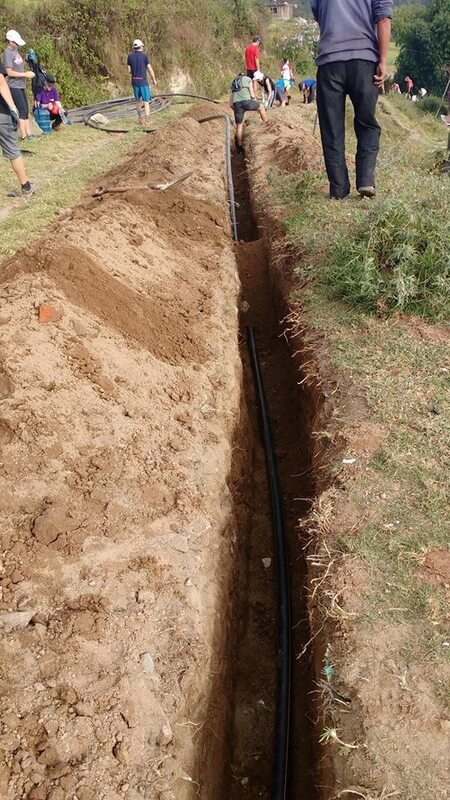 However much we ached and sweated it felt incredibly important to dig this pipeline and complete the mission. Digging through Himalayan rock is not that easy though! 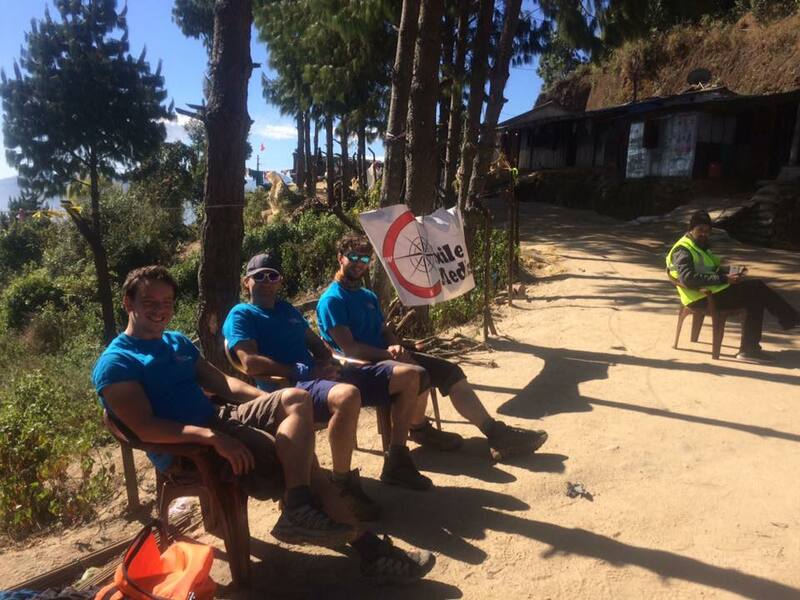 WE did it though, led by the exuberant Nick, founder of Impact Marathons and fuelled by the local dahl bat and rice. Again, I have to say, I return to the UK with a renewed gratitude for the simplicity of running water, and the power of damn good, hard physical work. You can always, always do a bit more than you think, and you need a lot less than you think too. Obviously digging a pipeline is the most appropriate thing to do before a marathon in the mountains, it’s a perfect taper no less! 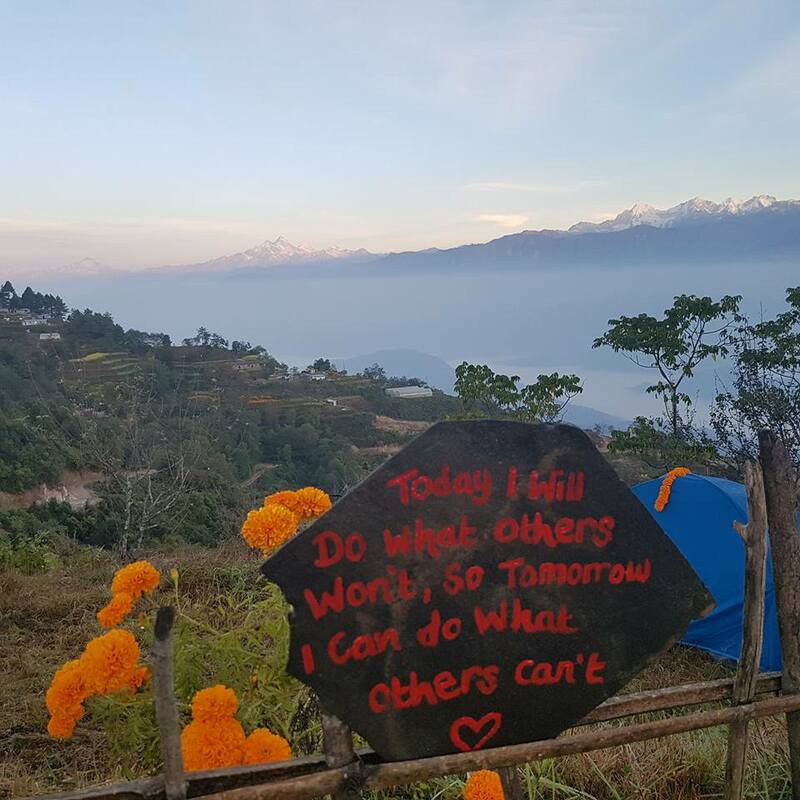 The following day, Nepalese cooking lessons were given, an old school projector movie of Mira Rai was shown in the Scout hut to inspire us, numbers were given, medic briefs done and some more rice and dahl bat, with an array of delicious curries filled our muscles set for race day! Now as dawn broke and my alarm went off at 4am, I had no idea what to expect. Although I had run the Romanian Bear Marathon & Stirling Marathon within the last year, I was not trained for this race specifically. Yet mind-set plans, pacing and food prep done, adaptions for hills and altitude I felt excited about a long day ahead. I don’t think anything could have prepared me for the route, it was completely breath-taking, with views that you only really see in Lonely Planet. Only around 50 did the marathon, so for many stages it was completely quite, just the noises of the forest to accompany your breathing. Because the terrain was pretty undulating and rocky, heads were down most of the time and you had to remind yourself to pause and take everything in, I’m so glad I did. Passing the check points with awesome Excile Medics closely observing you all, we headed to the final 10km. Oh my!! I have respect for everyone who runs any distance, but this 10km was something else… Around 3miles straight down the mountain (remember this is a Himalayan mountain! ), and then 3 miles traversing back up it. It was ridiculously hard, and although I was incredibly slow, I absolutely loved it! It just felt amazing to be doing something quite as crazy as this, in such a beautiful country. Nick the Organiser did an incredible job with his team, re-routing the whole marathon course due to a sudden landslide, huge respect to them all. As you finish the marathon you, marigolds are placed round your neck, children are laughing and smiling all around you and there is a huge sense of achievement. 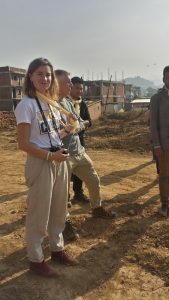 Becs, who has become a great friend, was like a gazelle on the marathon and was first lady home, winning the most beautiful Nepalese knife. Alongside the marathon, many locals, kids from Kathmandu, expats and more than the 10km and half marathon, such an inspiring, uplifting day. From the marathon we returned to our campsite for a wonderful evening of celebration, delicious food and goodbyes. It’s hard to end a blog like this and give it justice. I left at 3am in the morning to start the big journey home, and my lasting memory were all the children waiting for their buses at 3.30am to take the 2hr ride to school in Kathmandu. It reminded me, that however tough life is, if something really matter to you, you can make it happen. I’m over 4 years post weils encephalitis healing. I’m happy to say I didn’t bother the Excile Medics!There are many things I do to help manage my condition, like so many people. There are many things I still find incredibly hard, or cannot do yet, and I have my boundaries where I know I have to remove myself from the fun and go and be quiet. This blog is about the resilience, the heart and strength, the beauty and soul of an amazing country, people and group which I was blessed to spend a week with. It’s also about giving you I hope some courage to be brave, to make a decision, to take a risk and stop waiting for the right time, or for everything to be right. I have learned, that rarely happens, and when is right? You don’t need to go on a big adventure or do a marathon from reading this (of course if you want to, I will 100% help you), yet what I hope you do from reading this is, make a decision to embrace your fears with courage and make a change which will positively impact and add value to your life For if you do this, the ripple affect will spread to all those around you and you never know who you might meet or what might happen. I’m writing the ending at my home in Bristol a week on as I ran out of mental puff to complete it on the journey back! All that leaves me to say is the biggest thank you to the Impact Marathon Team, led by Nick, Lisa, Jacqs and so many others, they are one empowering organisation, fusing sustainable community projects with the power of running and adventure, and I urge you to check them out! To everyone who volunteered from all over the World, the experience we have shared is life enhancing and I thank you all. 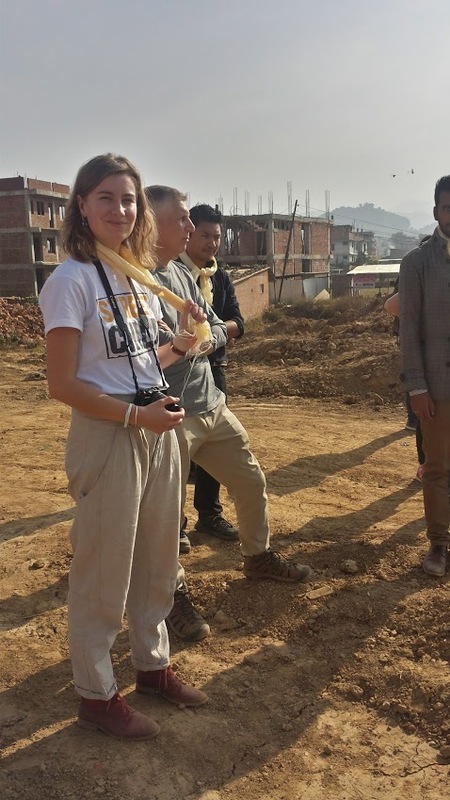 To Lucy and Street Child for continuing to make a massive difference in forgotten communities in pockets around the World, and to the Excile Medics for making trips possible and looking after us all, you are one fine, professional team. And finally to every person who has texted, messaged, donated and supported this adventure, YOU are brilliant. We’ve raised over £1,5k which will be doubled by the government and brings my overall fundraising total to over £80k, yea!! I am one million percent lucky to have had this amazing experience, and I promise you, you can create an amazing experience for your 2018 and I will fully support and help you make it happen. I still have fears, doubts and what if’s, but it’s about embracing your now!. ps. Look out for my feature with Street Child in Trail Running Magazine, out soon. Much Less Hungry than Normal at Altitude, Much more hungry now home! Encephalitis Episodes: 3 self managed, yippee! 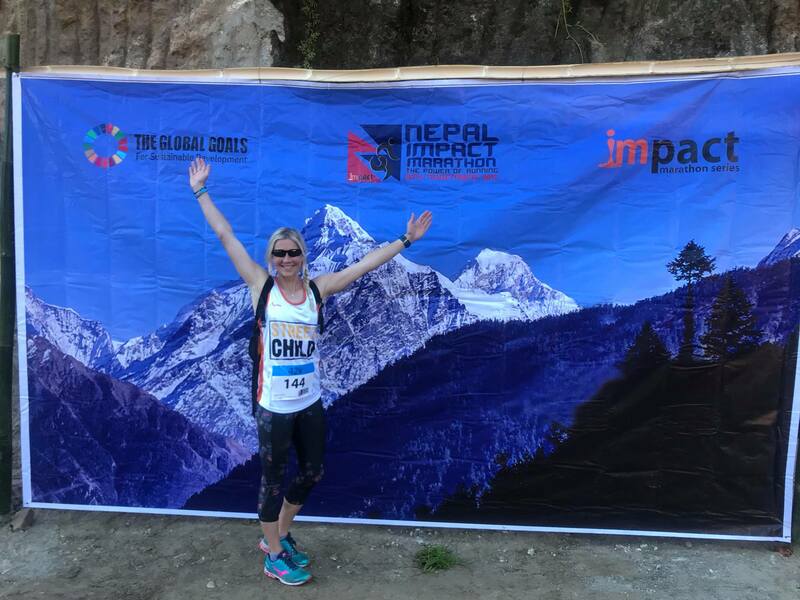 yet a challenge to comprehend I can run in the peace of the Himalayas, yet the beat of the music by the camp fire, having my haircut or a busy party in the UK challenges me more with the sensory noises. 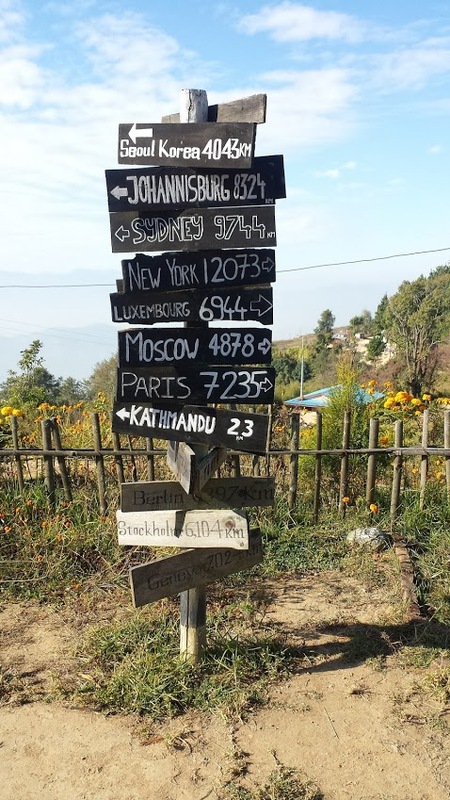 And its somehow easier to get to Nepal than Scotland for Christmas when you are not driving. The paradox of healing which challenges us all to grow. Hound of Happiness my little book which is a perfect gift and feel good weekly friend for you, and I give 10% to charity from every sale. For 2018 I challenge you to make a change, to have Courage and commit to making that change happen. A change of your habit, your thought and your well-being. 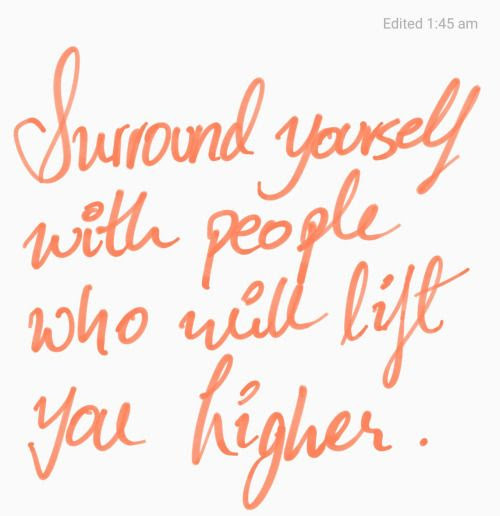 And if I can help you, just pop me an email at kim@energisedperformance.com or check out our courses. For DNAFit Testing which undoubtedly has helped me to achieve so many things more efficiently and effectively.